Aikido is a virtually infinite martial art. It is, at its best, a way of re-discovering the Universe in one’s self. It is an effective form of self defense at the same time it is an invaluable system for personal development. Traditionally Aikido was practiced as a “Martial Way” or Budo. It was very severe training and was not widely practiced by members of the population as a whole. After WWII the practice of Aikido was opened up to the public and taken from Japan to virtually every country in the world. At Aikido Eastside we have chosen to make the practice of Aikido as accessible as possible to students of all ages and inclinations. Please come in and watch a class and meet our instructors! We conduct seminars on Traditional Aikido, Aikido weapons work, multiple attackers practice, internal power development, Daito Ryu Aikijutsu, and Karate. All of these seminars are open to the Aikido community regardless of style or affiliation. Our month-long Beginners Program will teach students new to Aikido the basics of the art in a friendly, personalized environment with dedicated beginners instructors. The program runs during the Aikido Fundamentals classes and any student in the beginners program may attend any or all of the three Aikido Fundamentals classes per week. See our page for details or to sign up today! These classes are open to all levels and will cover material from our entire standard testing curriculum (including empty-hand, paired weapons, and weapons-taking) from 6th Kyu through 3rd Dan. Our Beginners Program runs concurrently during these classes. These classes taught by our Chief Instructor George Ledyard Sensei, as well as our two Assistant Chief Instructors Josh Drachman Sensei and Kevin Lam Sensei are open to all levels, but are not limited to our standard testing curriculum — they may occasionally or often have different focus or cover different material. Daito Ryu is a system of aikijutsu studied by Morihei Ueshiba, the Founder of Aikido. This is principle-based, body-centered instruction and will be of immense value in understanding how to do Aikido with “aiki”. We are affilated with the Ginjukai, headed by Howard Popkin Sensei and Joe Brogna Sensei of New York. 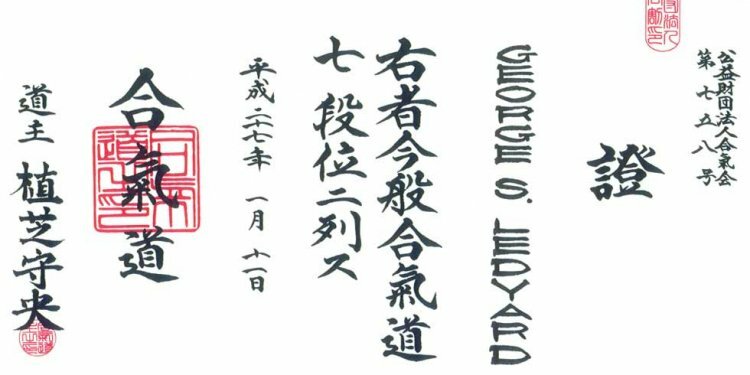 Private lessons with Ledyard Sensei are available. Students can train in the regular classes and use private lessons to enhance their skills or they can simply train privately (it is best for at least two students to train this way).